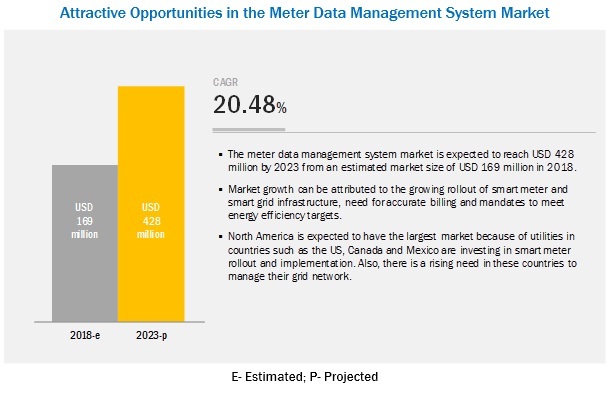 [139 Pages Report] The global meter data management system market is projected to reach a size of USD 428 million by 2023, at a CAGR of 20.48%, from an estimated USD 169 million in 2018. This growth can be attributed to factors such as growing government policies and legislative mandates for smart meters, need for grid reliability, and need for accurate utility bill generation. By component type, the software segment accounts for the largest contributor in the meter data management system market during the forecast period. The report segments the meter data management system market, by component type, into hardware and software. The software segment is expected to hold the largest market share by 2023. With the increasing smart meter installation, hundreds and millions of data is generated every 15 minutes and meter data management software is used to process, format, and correlate the data to support accurate billing. The residential segment is expected to be the largest contributor during the forecast period. The meter data management system market by end-use is segmented into residential, commercial, and industrial users. The residential segment is expected to hold the largest market share and the fastest growing market with smart meter implementations being mandated across global regions in the residential sector. Furthermore, residential consumers will have access to their energy consumption data through meter data management system, that will in turn help them in improving their energy consumption. In this report, the meter data management system market has been analyzed with respect to 5 regions, namely, North America, Europe, South America, Asia Pacific, and the Middle East & Africa. The market in North America is estimated to be the largest market from 2018 to 2023. Utilities in countries such as the US, Canada, and Mexico are deploying smart grid infrastructure and are looking to upgrade their grid network to prevent losses. Also, increasing need to generate accurate bills for consumers based on various tariff rates is driving the market. The major players in the global meter data management system market are Itron (US), Siemens (Germany), Landis+Gyr (Switzerland), Honeywell (US) and Schneider Electric (France), ABB (Switzerland), Eaton (Ireland), Kamstrup (Denmark), DIEHL (Germany), and Alcara (US). In January 2019, Siemens was awarded a contract by ESB to roll out 25,000 smart meters across Ireland. It would deploy a remote reading system and a data management system for ESB. In November 2018, Diehl Metering IZAR meter data management software was developed and available on Microsoft Azure cloud-computing platform. The software provides a central platform for all water and energy data and offers maximum efficiency for all metering processes. In October 2018, Siemens signed an agreement with DEWA to complete meter data management system for its ‘Smart Applications via Smart Grid and Meters’ initiative. The smart grid contributes to DEWA’s strategic goals of conserving the environment and natural resources by rationalizing consumption, ensuring the implementation of the demand-side management strategy to reduce energy and water demand by 30% by 2030. In September 2018, Itron developed the Enterprise Edition Meter Data Management (IEE MDM) solution onto the SAP HANA platform. With meter data residing on a common platform, utility customers can more easily leverage that and other relevant data to gain operational insights and efficiencies. The report addresses the market share analysis of key players in meter data management system market, and with the help of this, companies can enhance their revenues in the respective market. The report provides insights about emerging geographies for meter data management system market, and hence, the entire market ecosystem can gain competitive advantage from such insights. This study involved 4 major activities in estimating the current market size for meter data management system. Exhaustive secondary research was done to collect information on the market, the peer market, and the parent market. The next step was to validate these findings, assumptions, and market sizing with industry experts across the value chain through primary research. Both top-down and bottom-up approaches were used to estimate the total market size. Thereafter, the market breakdown and data triangulation was done to estimate the market size of the segments and subsegments. This research study involved the use of extensive secondary sources, directories, and databases, such as Hoover’s, Bloomberg BusinessWeek, Factiva, and OneSource, to identify and collect information useful for a technical, market-oriented, and commercial study of the global meter data management system market. The other secondary sources included annual reports, press releases & investor presentations of companies, white papers, certified publications, articles by recognized authors, manufacturer associations, trade directories, and databases. The meter data management system market comprises several stakeholders such as utilities, regulators, IT vendors, meter vendors, meter communication vendors, and analytics vendor in the supply chain. The demand-side of this market is characterized by its applications such as residential, commercial, and industrial. The supply-side is characterized by advancements in smart metering technologies such as comprehensive and fast reacting products and increased emphasis on meter data management system’s operational lifetime. Various primary sources from both, the supply- and demand-sides of the market were interviewed to obtain qualitative and quantitative information. After arriving at the overall market size-using the market size estimation processes as explained above-the market was split into several segments and subsegments. To complete the overall market engineering process and arrive at the exact statistics of each market segment and subsegment, data triangulation and market breakdown procedures were employed, wherever applicable. The data was triangulated by studying various factors and trends from both, the demand- and supply-sides, in the residential, commercial, and industrial sectors. Component, Utility Type, End-User, Application, and Region. Itron (US), Siemens (Germany), Landis+Gyr (Switzerland), Honeywell (US) and Schneider Electric (France), ABB (Switzerland), Eaton (Ireland), Kamstrup (Denmark), DIEHL (Germany), and Alcara (US). This research report categorizes the meter data management system market based on component, utility type, end-user, application, and region.